If Queen Victoria, in the great beyond, had a say in the matter, you could imagine her waving an imperious hand during the casting process for The Young Victoria, demanding that she be played by "that clever girl from The Devil Wears Prada." 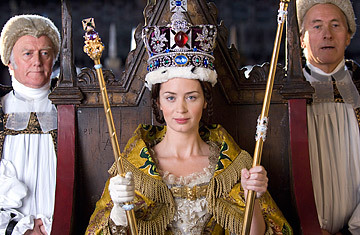 And her edict would have been wise, because Emily Blunt is utterly charming in this dramatization of the young Victoria's ascension to the throne and her courtship with Prince Albert. In the hands of director Jean-Marc Vallee and screenwriter Julian Fellowes, The Young Victoria adheres  mostly  to history. It's romanticized, with Victoria's beloved Albert (Rupert Friend) a more eager suitor than history indicates. And the movie may give British political scholars fits, because Lord Melbourne, the 58-year-old Prime Minister who coached Victoria in politics and queenly affairs, is played here by the dashing and quite youthful Paul Bettany, excising 20 years and at least as many pounds from Lord M.'s real person. In 1837 the teenage Victoria was heir to the throne held by her uncle, King William (Jim Broadbent), but living in royal lockdown at Kensington Palace. "Even a palace can be a prison," she tells us. We're well acquainted with the downside of royalty, thanks to the current Windsors' chatty ex-in-laws, but Victoria isn't just whinging. She sleeps in a room with her German-born mother, the Duchess of Kent (Miranda Richardson), has only her spaniel Dash for a playmate and isn't allowed to walk down stairs alone. Her governess, the Baroness Lehzen (Jeanette Hain), is the closest thing she has to a friend. But was it a wild love story for both parties? It can be a challenge to trust historical dramas. We're so used to being duped that even while we're enjoying a scene, we may think it's all made up. The Young Victoria features the jolly King William at his birthday banquet, quite in his cups, trashing Victoria's mother. It's a funny bit, ending with Richardson huffing off and some dry old man saying, ruefully, "Families." This scene has the mark of something written expressly for Broadbent by Fellowes, but in Lytton Strachey's biography Queen Victoria, and again in Christopher Hibbert's, you'll find that scene, told exactly as it is onscreen. The only difference is that Blunt's Victoria doesn't burst into tears as the real princess apparently did; the movie heroine has more backbone. She's also less gushy and girlish (Romy Schneider covered that ground in 1954's Victoria in Dover). Victoria left ample and surprisingly intimate diaries, as well as her sketchbooks, which provided evidence of her platonic infatuation with Lord M. (she mostly got misty-eyed over the idea of him as a young man) and her nearly instantaneous attraction to her cousin Albert, whom she described as "extremely handsome ... he has a beautiful nose and a very sweet mouth"  which is certainly true of Friend. But perhaps in deference to the contemporary audience's desire to see Victoria as a Queen shaping her own destiny, the movie tilts the balance of romantic power somewhat, giving us a Victoria gradually won over by Albert's attentions. He grumbles to his brother about the political nature of the courtship ("What do you say about a man who waits for a rich woman? "), but he's soon got the mushy look of a man more than ready to fulfill his duty. The suggestion is that he'll offer her an alliance of equals. Discussing the subject of husbands and political games over a chess match, he tells her, "I should recommend you find one to play it with you, rather than for you." He is as noble and upright as anything out of a Jane Austen novel  a savior, in short. We've grown so fond of Blunt's Victoria that we just want her to have a real friend, benefits and all. We may be looking at Victoria and Albert through rose-colored glasses, but this love story is a touching romantic confection, a fine way to follow up your figgy pudding. Long live Queen Emily.